My conversation with this amazing playwright! Mahesh Dattani at Confluence 2010. ‘Theatre being a mirror to society has a great deal of truth…’ says Mahesh Dattani while delivering his presentation on ‘The playwright’s Quest’ at Confluence – Asia International Literary Festival held recently in Guwahati. An attempt on mirroring the contemporary urban Indian society is very much a part of his theatrical output. Presently a resident of Mumbai, the playwright was born on 7th August 1958 in a Gujarati family settled in Karnataka then. This was his second visit to Assam, who first visited the state in 2007. The playwright’s short stay in the state is indeed appreciable, due to his wholehearted engagement with the audience, the students and above all the drama/theatre lovers. 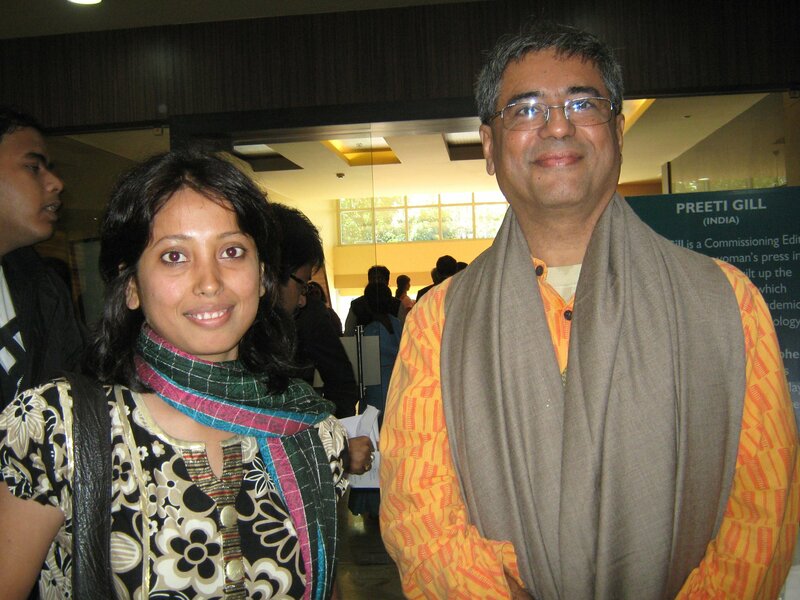 Mahesh Dattani is one of the most significant writers of contemporary Indian drama who has elevated Indian drama in English to a major genre of social criticism. He is the first Indian playwright to win the prestigious Sahitya Academy Award in 1998 for his collection of plays Final Solutions and Other plays. The diverse experiences of the playwright as being a member of the urban Indian society seem to have a great deal of influence over his writings – a playwright who firmly believes; ‘Who you are is reflected in your writings’. It is the society from which his plays originate, and eventually it is the society again to which they go back. His major concern seems to be the representation of the society, as experienced by him. A playwright with a background rooted to theatre, Dattani has his own theatre company Playpen in Bangalore. Dattani objects being categorized as a postcolonial playwright. He rejects the concept of a choice or a particular identity to render his thoughts and responses pertaining to the contemporary society, and his own life. Instead, he seems more concerned with choosing those themes that would best represent the contemporary scenario; and also a lively and recognizable Indian English that would do justice to his representation of the urban Indian society. However, his acceptance of the identity of an Indian playwright is based on his consideration that his writings as a whole constitute an endeavor at reproducing his own time and place – which is the contemporary urban India. Courageous and innovative, Mahesh Dattani voices the unseen and the unheard in his plays. In his theatrical writings there is inherent attempt to make visible the invisible existing realities. Voicing the experiences of the marginalized sections of our society such as minorities, gays, and women; his plays center on the themes of homosexuality, politics of gender, violence, identity, family politics, and so on. A questioning of the dominant gender identities is one of the major concerns that the playwright seems to exhibit. In some of his plays he makes an effort to reveal the ‘invisible’ ‘marginalized’ gender identities; which of course receives both grave and appreciative responses from the audience, reader and critic. His treatment of the issues of homosexuality, politics of capitalism, and violence against women in Bravely Fought the Queen’, and profound childhood trauma in ‘Thirty Days in September’ has been successful in exposing some hidden realities, compelling the audience to explore the dark side of a facade. The conflict between the traditional values and modernist approach to life is also apparent in his plays. However, he maintains a non- judgmental stance while scripting these social issues having contemporary relevance; and makes the audience contemplate over those issues by themselves. He only brings forward the issues, but abstains himself from sermonizing. Apart from writing plays and film scripts, he is also teacher of drama, an actor, and a director per se. Final solutions is resonant with theme of communal prejudices that still exist in the society. The play revolves around the theme of communal violence and its historical and contemporary repercussions. No final solution to the situation is found in the play; but there is an implication that a great deal depends on choices that people make to bring about changes in the society. The play has been performed in various places across the country and translated into different regional languages. Where There’s a Will, Thirty Days in September, Seven Steps Around the Fire, Dance Like a Man, Tara are some of his noteworthy contributions representing the everyday realities of the modern urban populace. His plays mostly represent the contemporary urban scenario of which he himself is a part. But at the same time he seems to be very enthusiastic to observe the impact of those characteristically urban issues being re-contextualized and performed in different settings. In his response to the performance of his famous play ‘Thirty Days in September’ at Rabindra Bhawan on 21th September, 2007, the playwright says that the transposition of the setting and the theme of the play to Assam (which was originally set in Delhi) and its enactment in the midst of Assamese cultural setting and Assamese family somehow enhances the power of the play. Dattani considers the staging aspect of a play as equally important. Theatre to him is very much a kind of shared experience between the society, playwright, director, actors and audience. Apart from the social responsibility of the playwright, a playwright also needs to understand the machinery of the theatre; which, according to Dattani is the most important requirement in a playwright. This is something that differentiates a playwright form a writer of poetry or novel. He says, ‘I create what is going to happen on stage, but I only begin that…’ Afterwards the play is taken by the director for possible enactments with the help of actors, who explore on stage what the playwright says, and finally the play goes to the audience. Stressing the importance of stage and performance of a play, Datatni states that one can have a play without a playwright and a director; but one can not have a play without actors and audience. The very act of scripting a play is a constant learning process, says the playwright during his deliberations on ‘the playwright’s quest’. While representing the society in his plays, Dattani’s specialty lies in his endeavor to use theatre to explore the hidden and polemical issues that exist in the contemporary urban Indian society. He remains true to the environment while depicting it in his plays; and considers theatre as the most convenient means of reflecting the society as it really is. He is a playwright, who very much believes in the inherent potentialities of theatre that can turn itself into an active agent for social change. The very act of voicing and enacting the problematical issues relating to the contemporary urban Indian society reflects his thoughtful social anxiety. Zubeen’s Mission China – a film with a mission! He was my music teacher! When you become a dead soul! Vaibhaw verma on And she realises!